Biosynth’s new econoLuciferase™ (econoLuc Biosynth Cat. No. L-8090) is a recombinant luciferase from the firefly Luciola lateralis that has been expressed as a luciferase-GFP fusion protein in E. coli. The new luciferase enzyme has been optimized for increased thermo-stability by genetic modification to be stable for one hour at 37°C and up to two days at room temperature. Stabilized econoLuciferase™ thus overcomes the disadvantages and limitations of l wild-type uciferase, notably its short active life, outperforming enzyme from the Photinus pyralis firefly for both performance and stability. This optimized luciferase is the perfect enzyme for ATP-assays in hygiene control, microbial tests using caged luciferins and it is the luciferase of choice for biochemical tests measuring ATP consumption and production in diverse enzymatic reactions. Luciferase was discovered during the 1950s thanks to the pioneering work of William McElroy at John Hopkins University, which led to the understanding of the fundamental principles that regulate the luminescence of natural firefly luciferase (FLuc). The enzyme and its substrate were extracted from thousands of North American fireflies (P. pyralis). As a result of these intensive efforts FLuc was obtained for the first time in pure form in 1956. Subsequently it was possible to reveal the structure and molecular weight (61 kDa) of the protein. In 1957, 9 mg of pure luciferin for structure elucidation was obtained from 15,000 insects. This discovery led to several hypotheses on the nature of the possible reaction intermediates, but isolation failed due to their short half life. However, a few years later Emil White was able to obtain luciferin by chemical synthesis which enabled further studies on its chemical properties. 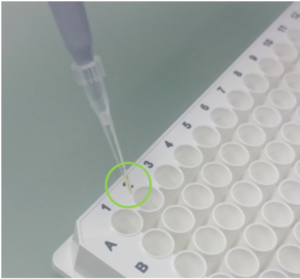 However, the wild type luciferase from P. pyralis suffers from some severe limitations as a testing medium, becoming inactivate after only 10 minutes at 37°C or after about six hours at room temperature. The stability of econoLuciferase™ was tested in a buffered solution at different temperatures. Commercially available luciferase (recombinant wild type Photinus pyralis) was tested in the same way. Both luciferases were incubated either at 37°C, room temperature or in a refrigerator (4 to 8°C) for up to 120 hours then the measurement was started by adding the substrates. 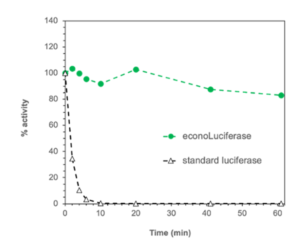 Thanks to its increased bench stability, econoLuciferase™ is the ideal enzyme for bioluminescence assays with both native D-luciferin (dLuc) and synthetic ProLuciferins (caged luciferins). As a stable enzyme, it allows the user to perform experiments in a wide range of physiological conditions and gives maximum flexibility for use in automated high-throughput ATP tests as well as manual single cuvette tests. In addition, econoLuciferase™ performs with maximum sensitivity: ATP can be detected at concentrations as low as 0.2 fmol in an 1 ml test. Alllows more economic ATP testing: 200 µL econoLuciferaseTM solution provides 2,000 assays. User-friendly with easier handling: just add 1 μL of econoLuciferaseTM to 1 mL of luciferase assay buffer. econoLuciferaseTM is stable in assay buffer for 1 to 2 days at room temperature and for 5-7 days at 4-8°C. The working solution can still conveniently be used the next day. The product is presented as a 10 mg/mL buffered aqueous solution with glycerol with 2Dry-ice shipment avaialble. The nucleoside Adenosine triphosphate (ATP) provides energy to fuel many metabolic processes. As a result it is found in and around living cells, and is a direct indicator of cellular health. ATP can be easily quantified by using a luminometer to measure the light produced by the reaction with luciferase and luciferin. The amount of light produced is directly proportional to the amount of ATP present in the sample. In the first step luciferin is activated by ATP to yield a reactive mixed anhydride. In the second step the activated intermediate reacts with oxygen to create a transient dioxetane that is broken down to form oxoluciferin and CO2 under emission of visible light. For more technical information, to download the product information sheet and to purchase online please visit Biosynth’s product web page (See Resources). Click on Biosynth econoLuciferase™ for ATP tests, microbiology and biochemical assays for more information. Click on BIOSYNTH to contact the company directly. Click on econoLuciferase™ (econoLuc) Cat. No. L-8090) for further information. 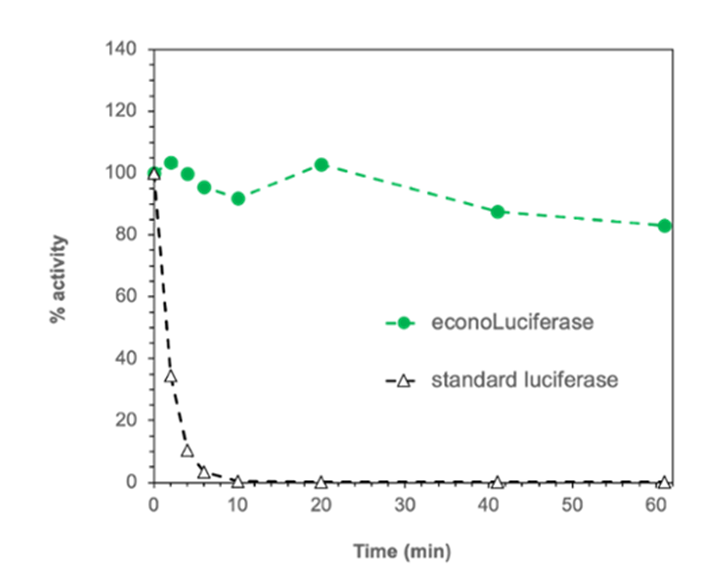 Comparative stability of econoLuciferase™ and wild-type firefly luciferase: Biosynth’s econoLuc shows significantly improved stability; e.g. after 60 min incubation at 37°C econoLuci retains >80% of its initial activity, while the wild type luciferase is completely inactivated after 10 min. High sensitivity and performance: ATP standard curve with econoLuc. 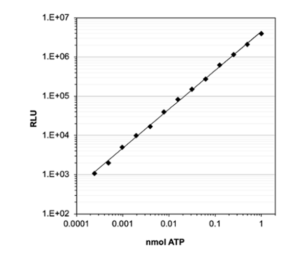 shows signal linearity over a wide ATP concentration range. 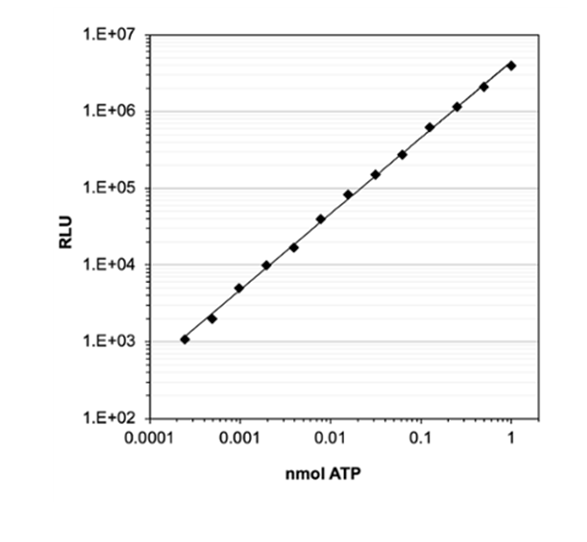 Using Biosynth econoLuc and luciferin, bioluminescence signal shows linear correlation to ATP concentrations from 0.2 fmol to 1 nmol.